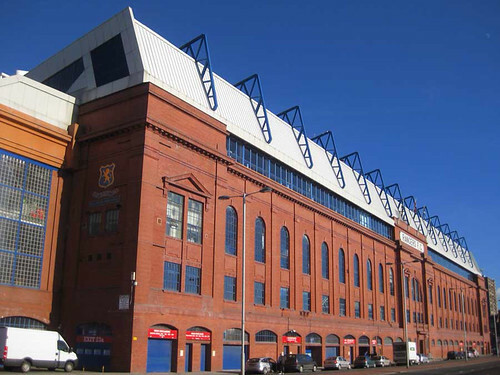 There can be few greater sights for a Rangers fan than walking to Ibrox on a match day and catching a glimpse of the red bricked facade we now call the Bill Struth Main Stand. Whether it be a side view turning onto Edmiston Drive from Paisley Road West, or a full on frontal heading over the M8 from Dumbreck Road, it never fails to stir the emotions. 476ft wide consisting of 1,018,000 Red Welsh Bricks held together by 536 tonnes of cement, this 84 year old Grand Stand most certainly has a few stories to tell. Just as intriguing though, is the story of how the Old Lady who resides at 150 Edmiston Drive came to be. 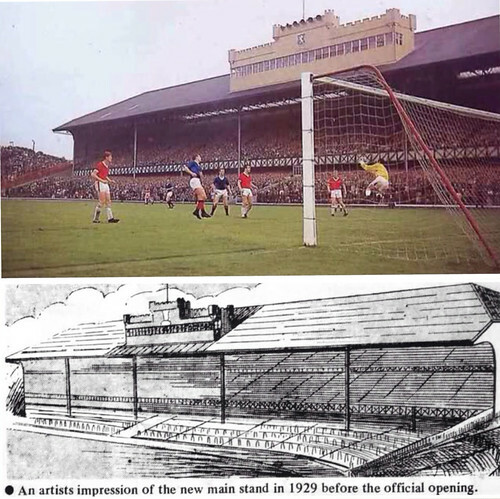 The original South Stand and the Pavilion at its east side (opened in 1899) had not been constructed to a high specification, mainly due to the club being unsure whether their tenure of the site would last longer than the 10 year lease they had signed, and also to keep costs down. By the middle of the 1920's, however, with the original stand still in place, the need for a replacement was greater than ever. 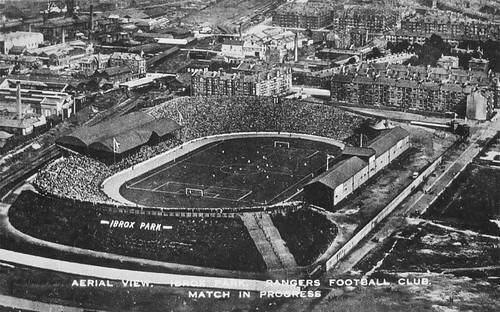 The success of Rangers in the early 1920's under the stewardship of the great Bill Struth ( winning 8 out of 10 Titles between 1920-30) was the catalyst and the source of finance for a new Grandstand. In 1923, the Rangers directors' opened talks with the man who had already designed the steep slopes of Ibrox Park, the Pavilion and the outdated and outgrown South Stand, Glaswegian Archibald Leitch. 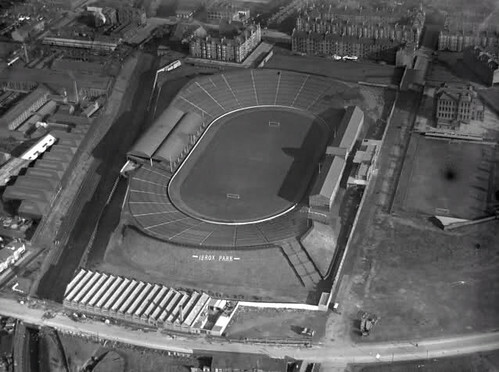 Ibrox Park, with the old South Stand and Pavillion. The entire ground designed by Archibald Leitch. Born in 1865 in Glasgow, Archie would have been of school-age when four young lads formed a football club called The Rangers. He might even have caught a glimpse of the Light Blues as he walked to school through Glasgow Green from his tenement in the Gallowgate to Hutchesons' Grammar in the Gorbals. As a married man and respected draughtsman (as he described himself in his marriage certificate), he lived in Kinning Park when Rangers moved to Ibrox area. If Archie did attend Ibrox is unknown, but it is fairly certain he indeed was a Rangers fan. His grandchildren recall that he owned shares in the club, and had a mug with the inscription 'Good Old Rangers'. 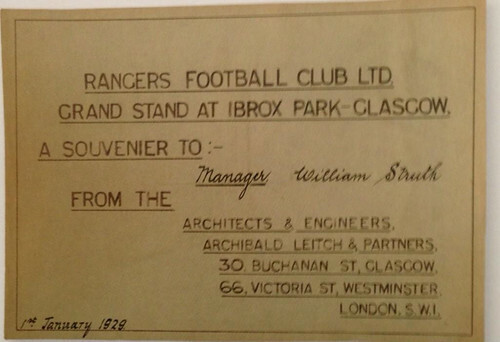 That he designed the slopes of Ibrox Park, the old South stand and the Pavilion without claiming a penny in fees surely points to the fact that dealing with Rangers, like to us all, was a labour of love! 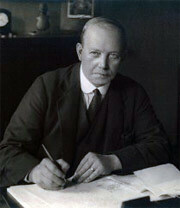 The Ibrox he designed was the first football ground he drew up plans for in a distinguished list of famous old British grounds including Old Trafford, Stamford Bridge, Highbury, White Hart Lane, Goodison Park, Anfield, Craven Cottage (the Cottage is of similar structure to the old Ibrox Pavilion, but not as grand) Ewood Park, Ayresome Park, Bramall Lane, The Den, Roker Park, Hillsborough, Tynecastle, Villa Park, Dens Park, St. James' Park, Twickenham (albeit for Rugby) Fratton Park, Molineaux, Hampden Park ( Redevelopment) and The Dell. Believe it or not, that list is not exhaustive! As he approached his 60th year and retirement, the one commission he probably most wanted to secure was the design of a new South Stand for Rangers. 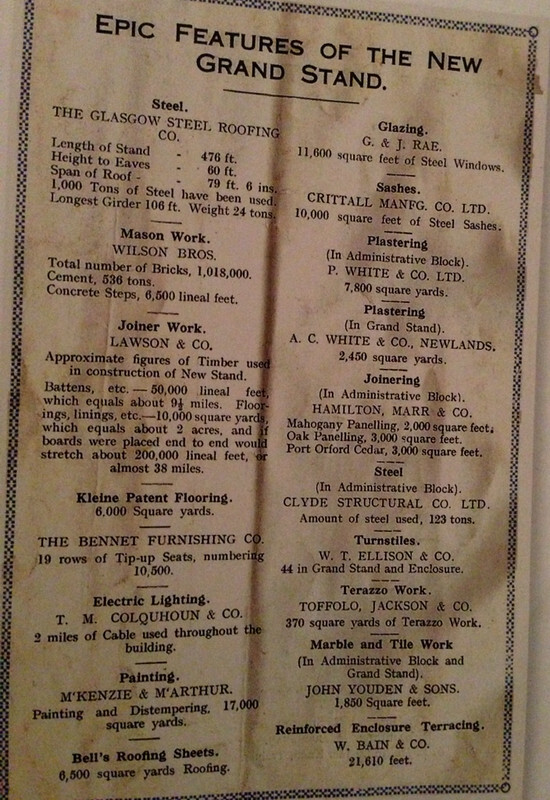 Having discussed with Rangers the need for a new stand around 1923, Leitch started an initial construction phase a year later. An office and dressing room block on the land between the old South Stand and Edmiston Drive was built, rendering the old Pavilion obsolete. It was demolished. You can see in the picture below the new office block and dressing rooms, with rubble from the demolished Pavilion clear to see across from the Ibrox Primary School. The picture was taken on 6th October, 1927. 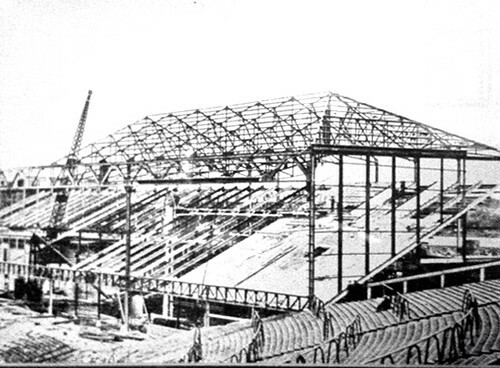 During the initial construction phase, and before plans were made for the design of the Grandstand, Leitch invited the Rangers Directors' to take a look at his latest creation, the Trinity Road Stand at Villa Park. It is likely that the Rangers directors could have been influenced by the splendour of that new Grandstand. The look of the stand had a lot in common with the Trinity Road Stand in Birmingham. The arched openings at ground level, the pediments, metal framed windows and the mosaic crests etched on both end walls, as well as the red brick facade. It's a travesty that the Trinity Road Stand was demolished in 2000. 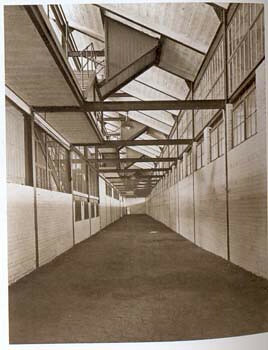 Another feature of Leitch designed stands was the 'Mosaic Welcome' which was constructed at each entrance. Sadly, of the stands Leitch designed, only 2 survive. Ibrox, of course, and at Tynecastle. The other side of the Red Brick Facade was to be the functional half of the design. If it was Archie the Architect who drew up the plans for the aesthetical exterior of the stand, it was Archie the Engineer who designed the seating area and the enclosures from where the fans of the Light Blues would support their team. This side was characterised by Leitch's trademark Balcony Detailing. Of the 17 Leitch built stands featuring this highly distinctive balcony, only 4 survive. Ibrox, of course, 2 stands at Goodison Park and Fratton Park. Portsmouth however, have covered theirs with advertising hoarding. Below are the drawings for Goodison Park's Bullen Road Stand. The upper deck consisted of 19 rows, offering a total of just under 10,500 seats. The lower deck enclosure was designed to hold 15,496. 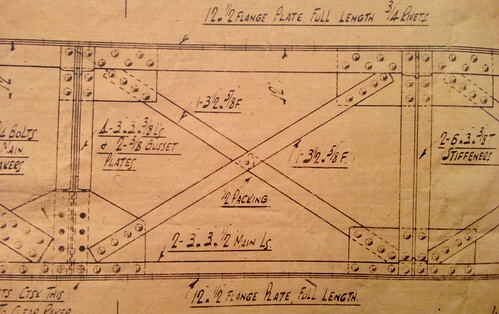 The crush barriers that adorned the new stand and the rest of Ibrox, and almost every ground in Britain, were designed and patented by Leitch. To literally top it all off, an imposing castellated Press Box sat on top of the stand, perhaps taking its inspiration from Hampden. Artist's impression v the real thing. A view from inside the South Stand. The photographer seems to have caused quite a stir. The gentleman front/centre is believed to be John Allan, author of the very first history book on Rangers. If the exterior of the new stand gave a show of the prestige and power of Rangers, and was the standard from which all other Leitch stands were to be judged, then the interior of the stand would exude, and help foster the Rangers Standard which Bill Struth nurtured from his early days in charge of the club. The famous Blue Room, more or less unchanged since the Grandstand opened, is adorned with polished oak panelling, which was fitted by carpenters from the John Brown Shipyard who were working on the Queen Mary at the time. The wood panelling itself for the new stand totalled 2,000 sq. ft. of Mahogany, 3,000 sq. ft. of Oak and 3,000 sq. ft. of Port Orford Cedar. 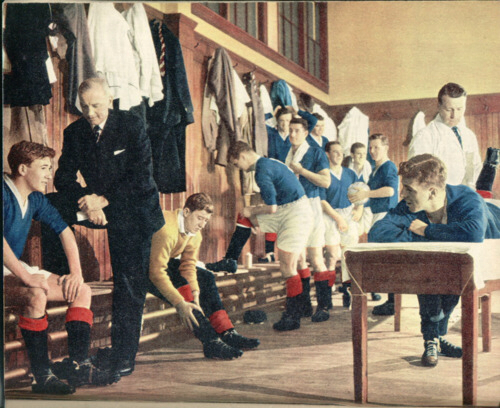 The pegs in the home dressing room to this day are the originals, ordered specially by Bill Struth so that players could hang up their bowler hats before getting changed. 1,850 sq. ft. of Marble Staircase and flooring was supplied by John Youden & Sons, who also provided similar to the new Kelvin Hall in 1927. The Glasgow Herald of 12th July 1927 opined of the Kelvin Hall staircase, 'The effect is one of great dignity and repose', and who would argue that our magnificent staircase is any different. The famous blue and white wrought-iron gates were built to Leitch's specification in 1928. The original gates now stand at the corner of the Broomloan Road Stand and the Main Stand. This wasn't always the case, however. 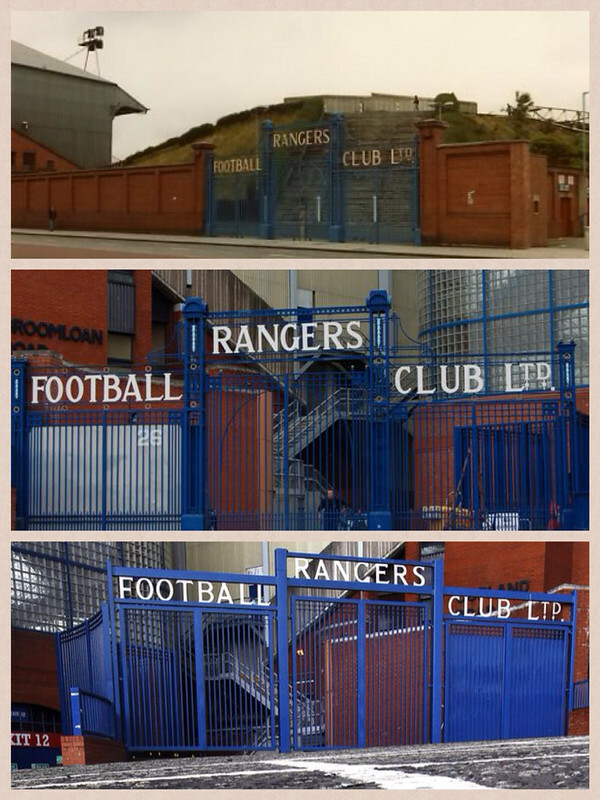 As the pictures show the original gates were positioned at the Copland Road end until the Club Deck renovations began. 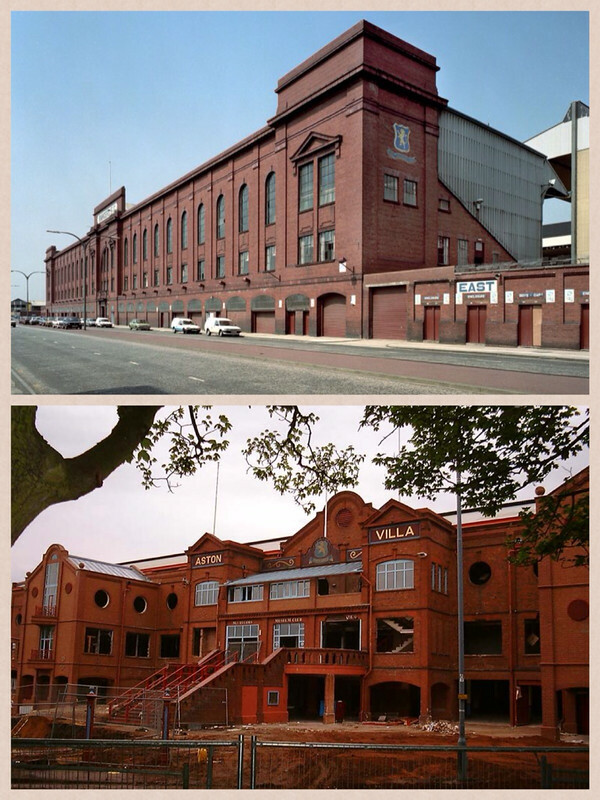 They were moved and placed where they reside to this day, and a vastly inferior imitation is now situated between the Copland and Main Stand. A unique feature of the stand was a players warm up area. The fans in the new stand could stand directly above the players and watch them go through their paces. The Trophy Room wasn't always a trophy room. Until 1959, it was a billiard room for the players to unwind. Scott Symon changed all that with his idea for a room to show the gifts and trophies won throughout the years. It's welcome news that plans for a museum in the newly acquired Edmiston House are in place, however I hope it does not take anything of the 'Trophy Room Experience' away from the famous old room. 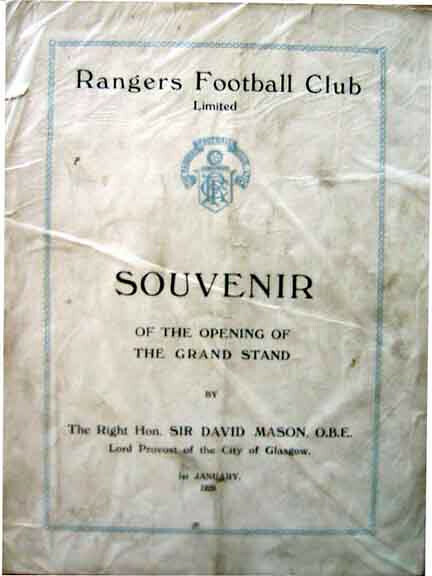 The new stand was officially opened by the Lord Provost of Glasgow, Sir David Mason on 1st January, 1929, in a match v Celtic. Fittingly, Rangers ran out 3-0 victors. 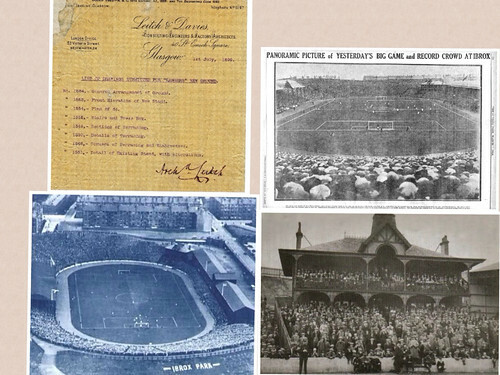 Below are some excerpts from the program on the day, and the cover of the leather bound photographic album Archie Leitch presented to Bill Struth, dated 1st January 1929. 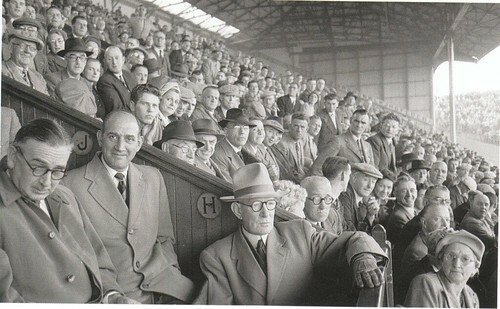 Ibrox and its Bill Struth Main Stand is the only stadium where one can go on a guided tour of an Archibald Leitch stand. Considering the clients whom Leitch designed and built stands for over the years, it really is a great testament to Rangers and the clubs devotion to preserving tradition and recognising history whilst moving with the times and modernising the stand with the addition of the Club Deck. 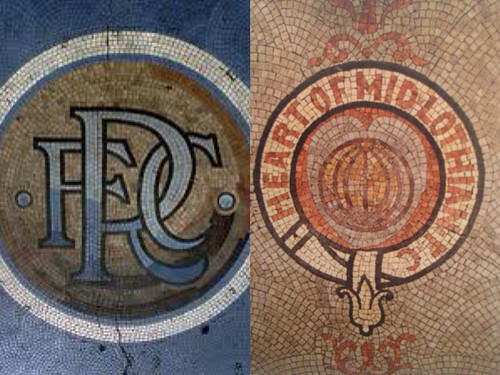 One only hopes our new custodians have the same respect for our clubs heritage. The Grandstand was granted a Category B Status Listed Building in 1987, which goes to show that former stonemason, and arguably the most important Ranger of all time, Bill Struth was quite correct in his assertion that, ' It will be here long after the others have gone'.